Minervois; photo courtesy of CIVL. TICKETS ARE SOLD OUT. THANKS FOR YOUR INTEREST! It has been far too long since the last tablehopper wine tasting, so I am happy to announce this upcoming tablehopper wine tasting and class in conjunction with the CIVL (the Conseil Interprofessionnel des Vins du Languedoc, the joint trade council of the AOC wines of Languedoc). 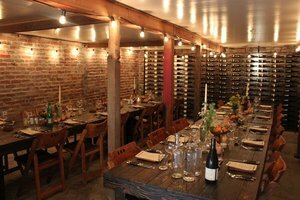 We will be tasting a variety of appellations from the Languedoc, and the very talented Josiah Baldivino, currently the head sommelier at MICHAEL MINA, will be leading the tasting. This Saturday afternoon event will be in the swanky private room of Café des Amis in Cow Hollow, starting with a reception at 2pm, and then we’ll sit down at 2:30pm for the tasting and education session (and Q&A) until 4pm or so—knowing how everyone likes to taste and talk, it will probably run a bit later. Some light hors d’oeuvres will be served during the reception (including green bean beignets and mini versions of my latest obsession at Café des Amis: the French dog! ), but it won’t be a replacement for lunch, just FYI. 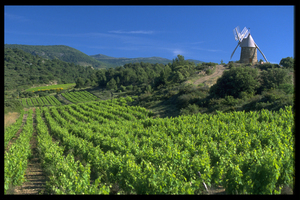 Did you know the Languedoc-Roussillon region is the largest wine-growing region in the world? It extends along the Mediterranean from the Rhône Delta down to the foot of the Pyrenees. It’s not only the largest wine-growing region, but is also one of the oldest, so there will be much to learn and taste. There will be plenty to taste, or this wouldn’t be a tablehopper event, ahem. There will also be tips on how to taste wine, and some food and wine pairing pointers with these delicious wines (Josiah passed the advanced sommelier exam last August, so he’ll have a great deal of expert insight for us). Tickets are $35. Seats are limited (40 total), so get your ticket sooner rather than later. This special event is a kickoff to L’Aventure Languedoc, from May 1st to May 31st, a month-long and citywide promotion of Languedoc wines at a variety of restaurants and wine shops in San Francisco. PLEASE NOTE: There are no ticket refunds if you can’t make it to the event (unless we can fill your place, but there are no guarantees about being able to do that). Also, there is a trade tasting on Monday April 2nd at the Westin St. Francis from 1pm-4pm. Register here. 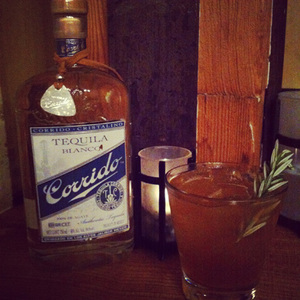 The Grassroots cocktail; photo from TRES. This Thursday March 29th, ~TRES~ is launching Aficionado, a monthly tequila and food pairing. This month’s edition will feature Tequila Corrido Blanco and a food partnership with La Cocina and Chaac Mool; new bar manager Joel Baker will be introducing three brand-new cocktails. Diners will enjoy five courses of dishes from the Yucatan and tequila pairings: $75 plus tax and gratuity. 6pm-9pm. On Sunday April 1st, ~REFORM CLUB~ is holding a dinner with Mi Casa Tequila and drinks prepared by Ricki Pavia (Rickhouse, Mi Casa Tequila). The menu is $40, plus a drink supplement of $25; a flight of tequila is available for $15. A dinner party at Scribe; photo from Facebook. Coming up in April are three very special sunset and wine release dinners at ~SCRIBE WINERY~ in Sonoma to celebrate the release of three new estate wines. On Thursday April 12th, Anthony Strong of Locanda will cook to coincide with the sylvaner release; Thursday April 19th is Nick Balla of Bar Tartine for the release of the skin-fermented chardonnay; and Friday April 27th is Sylvan Brackett of Peko-Peko and the riesling release. Click through here for more details and tickets. $125 per supper. 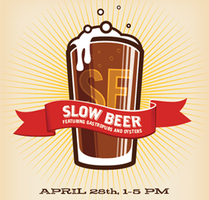 On Saturday April 28th, Slow Food San Francisco and the San Francisco Brewers Guild present Slow Beer. Over 25 handcrafted beers by the San Francisco Brewers Guild members will be showcased along with artisanal food provided by local producers. Participants include: ThirstyBear Brewing, Magnolia, Hog Island Oysters, Monk’s Kettle, Abbott’s Cellar, 21st Amendment, Anchor Brewing, Beach Chalet, and Speakeasy. Proceeds from the event will benefit Slow Food San Francisco programs. 1pm-5pm. $50 advance online purchase; $60 at the door. Golden Gate Park County Fair Building, 9th Ave. and Lincoln Way. Available now through Saturday March 31st, ~TWENTY FIVE LUSK~ is offering a beer and bites pairing menu in the lounge area and both bars (upstairs and downstairs). You get three six-ounce pours of Belgian ales (St. Bernardus Wit, Delerium Tremens, and Bacchus), along with three dishes (spiced prawns, a pork belly steam bun, and a roasted duck crêpe with Comté), all for $28.